So I had a sweet potato stashed in my cabinet that I was determined to use up before it started to turn brown and smell bad…not that stuff like that happens in my house (often)… Anyway, I also figured I should get around to using the quinoa that I shelled out for about a month ago and still haven’t cooked. So, after a brief pinterest search, I basically made up my own recipe. 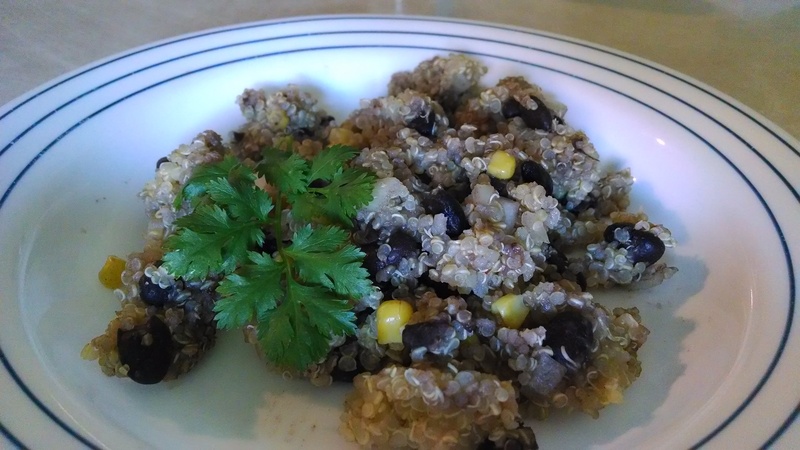 Solar cook the quinoa and water in a glass dish for about 1 hour or until the water is absorbed. Microwave the sweet potato until mushy. Mix all ingredients together and season to taste. I didn’t start early enough with my solar cooking. I thought I could cook after 4:30, but apparently I was wrong. After a half hour of solar cooking, my quinoa was still just sitting there. So I finished it off in the microwave. The result was edible, but not much more. My older son refused to eat it. I may have to put syrup on it tomorrow to see if that helps. Rating: A good idea gone bad. I think some changes could help, but as is, I would not make this again. It’s the week before grocery shopping, and we have odd stuff left in the house. I moved the rice aside yesterday to find a whole trove of quinoa. We had cooked black beans in the frig already from a meal that didn’t quite make it the day before, and there was still corn in the freezer. Thus my refrigerator decided dinner. I cooked the quinoa first. Put just the quinoa and the water in a dish, cover, and solar cook till the seeds open up and it looks fluffy. Then put all the remaining ingredients in a baking dish with about one and a half cups of cooked quinoa. Season to taste. I like about a teaspoon of cumin and about a tablespoon of lime juice. Cook in solar cooker until the onions are soft and the corn is defrosted. Spritz with more lime juice and garnish with cilantro. Rating: okay. My nephew wouldn’t touch it. I liked it but not enough to make purposefully again. I am looking forward to planning some new meals. One bonus of the solar cooker is that I can actually bake this summer! It’s far too hot here to bake inside during the summer, but this year I can bake outside! I am pretty lazy when it comes to cooking, which is why the solar oven and one pot meals are so attractive to me. I love how quick it is to throw everything in one dish and have that much less mess to clean up at the end of it all. Stir all together in an oven safe pot, put the lid on and then solar cook for a few hours. Mine took about 2 hours. It is done when the quinoa is fluffy. Then bring it inside and add some quartered grape tomatoes, as well as the juice of one lime, a bit of cumin, and some salt and pepper. A sprinkle of sugar won’t hurt either. Stir well and enjoy! Rating: success! My kids ate it, and it was naturally vegan and gluten-free so my nephew could have some also. I need to look up more one dish dinners to solar cook!